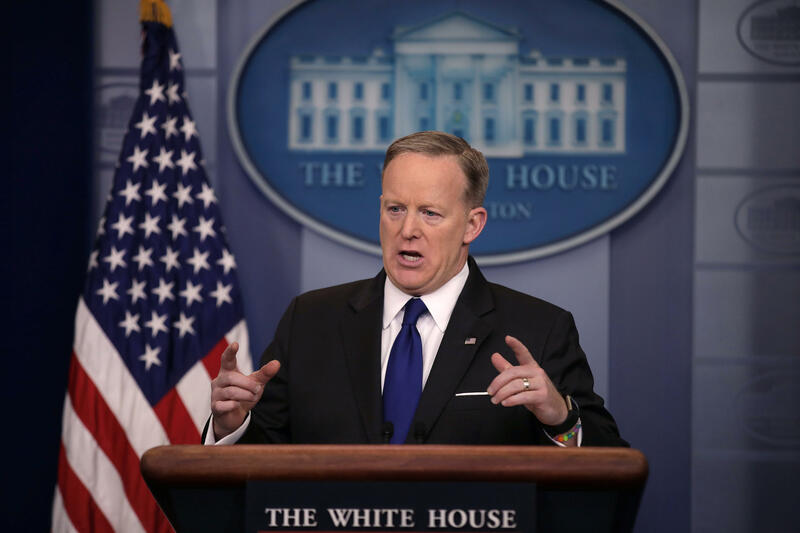 Syria: Sean Spicer says U.S. must accept "political reality"
White House Press Secretary Sean Spicer dealt with foreign policy blowback Friday, over the Trump administration’s decision not to call for Syrian dictator Bashar al Assad to step down. Lawmakers on Capitol Hill were furious that Tillerson and Haley both said regime change is not U.S. policy, and that Syrians would decide Assad’s fate. Their phrasing was strikingly similar to the lines used by the Russians and the Iranians. “I think the status and the longer-term status of President Assad will be decided by the Syrian people,” Tillerson said during a trip to Turkey Thursday. The secretary of State was not supposed to walk out and announce what appeared to be a Syria policy -- because the White House is still forming one. In short, he accidentally made news. U.N. Ambassador Nikki Haley echoed the sentiment Thursday. “You pick and choose your battles and when we’re looking at this, it’s about changing up priorities and our priority is no longer to sit there and focus on getting Assad out,” Haley told a small group of reporters, Reuters reported. However, what Tillerson did articulate is the same policy that Obama adopted at the end of his term. That is, to put ISIS first, and let Assad stay for the foreseeable future. In fact, then-Secretary of State John Kerry was working with the Russians to include Assad in an election and to have him stay in power for an indeterminate period of time. In short, no Western power, and certainly no U.S. president, has made taking Assad out of power a priority despite any public hand-wringing about the Syrian president’s industrial-scale killing, starvation, and war crimes against his own people. It’s a lot of talk with no plan of action. The Trump administration is not considering changing that and is already walking back the president’s previous calls for safe zones to protect Syrian civilians and contain refugee flows. Instead, the White House is now calling them “interim de-escalation areas,” an idea which hasn’t been fleshed out yet but are essentially expected to be areas where there are de facto ceasefires along the border with Jordan and Turkey, and hopefully in Idlib province, so that the coalition can focus on fighting al Qaeda linked terrorists there. As for the reports of chemical attacks by the Assad regime on rebels and civilians in the Hama province Thursday, multiple sources tell CBS News that the U.S. is still trying to determine the type of gas used. The White House said it’s “looking into the issue” and the Organization for the Prohibition of Chemical Weapons (OPCW) has been informed. The Trump administration has not announced a policy on use of chlorine gas and other weaponized chemicals. For now, it seems to mirror the Obama administration’s position. Unless the gas used was on the list of chemicals explicitly banned under the U.S.-Russia brokered deal, there is no consequence other than public condemnation.